This photo was taken shortly after the tattoo was done by artist Ron Henry Wells, who graciously allowed me to copy it from his site and reprint it here. He noted that he "used a antique typewriter that [he owns] as reference". He was also swift to point out that the picture's not that great, as the curve of Claire's thigh makes the tattoo look a little warped, but he swears it is straight. I would beg to differ, as the photo really captures the beauty of the tattoo and the wonderful artifice of the tattooist. "I love writing, tattoos and typewriters. When I met with Ron at Anonymous Tattoo in Savannah, Georgia, he seemed as psyched about doing my tattoo as I was about getting it. Ron asked a few simple questions. “How do you feel about birds?” I felt good. “Flowers?” I also had positive feelings about flowers. And then, we were off. Two sessions and some intense pain later, I came out with this amazing tattoo. 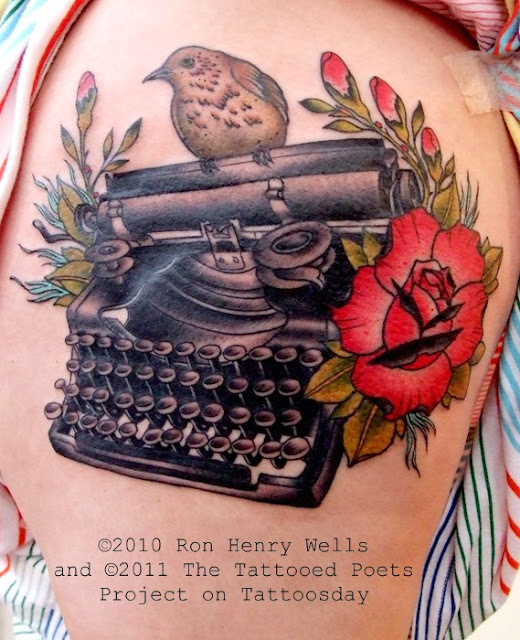 Writing will always be part of my life, and now so will this tattoo." when there are kazoos in the world? of a person I rarely see. beauty from spit and plastic. on your shirt, and slipped the kazoo inside. Claire Nelson is a senior Dramatic Writing major at Savannah College of Art and Design in Savannah, Georgia. After graduation Claire will be moving to Tallahassee to pursue her M.F.A. in poetry at Florida State University. As for Ron, he is currently working out of the Boston area, but occasionally is a guest artist at Three Kings Tattoo in Brooklyn. 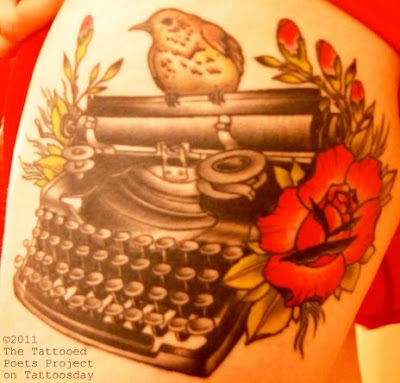 Thanks to Claire for sharing one of the best tattoos we have seen in this year's Tattooed Poets Project, and for sharing her poetry as well, here on Tattoosday. This entry is ©2011 Tattoosday. The poem is reprinted here with the permission of the author. And there's Claire!! I like the new photo, too.